I'm always dismayed by the sheer volume of terrible resume writing information floating around online. It seems to me that everyone has an opinion about resumes, including people who have never written one for anyone other than themselves. If you're not careful, that kind of ill-informed information can really get in your way when you are job searching. Here is the truth about some common myths about resumes. Myth 1: One great resume will work in all situations. Your resume should be tailored to fit each job that you are seeking. That means, if you are applying to several different types of jobs, you will need several very different resumes. It also means that you should tailor your resume to similar jobs at different companies. So, even if you are applying to the same job at two different companies, you will have a better shot at getting an interview if you fine tune each of those resumes to address each specific employer's needs. Revising your resume for each job may feel like a lot of work, but if it's done well, it can go a long way towards making you stand out from the competition, and if it shortens the time you spend job searching, it's well worth the extra effort. Myth 2: A general resume is fine because I can cover the specifics of each job in a cover letter. If you rely on your cover letter to communicate crucial information that an employer must know, you will almost certainly miss out on some great opportunities. Some employers put a lot of importance on resumes, and they will not read a cover letter if the resume does not convince them that a candidate has all of the essential skills required to do a job. If a skill is essential to the job, and you have that skill, it must be communicated clearly on your resume. That means again, if you are looking for more than one type of job, you will need more than one resume. Myth 3: Including a profile on your resume will limit your options. Some "experts" perpetuate this myth and say a profile is unnecessary. I say those experts have never been responsible for sorting through piles of resumes to find a few people who should be called in for interviews. If you've ever sorted through mountains of resumes looking for a few great candidates, you know that reading a good profile instantly brings focus and helps you to understand the job seeker's main skill areas. A resume that lacks a profile is much more difficult and frustrating to try to read and understand at a glance. A profile is a brief statement about the type of work you are seeking and qualified to do. It belongs at the beginning of a resume and helps employers read your information more quickly and intelligently. Unfortunately, some people avoid writing a profile in the mistaken belief that a more generic resume will keep them open for more job opportunities. Employers look for focused resumes. They are easier to read and understand at a glance, and your focus shows employers you are goal oriented and uniquely qualified for the specific job they need to fill. In fact, if you try to write a resume that shows you are qualified to do many jobs, you can easily end up looking as though you are not specifically and uniquely qualified to to any job. When you try to appeal to everyone, you end up appealing to no one. Don't worry that a specific profile will limit your opportunities within a company. Any reasonable employer who receives your resume would be willing to consider you for a job other than the one stated in your profile if he or she felt that the other job was a better fit for your skills and experience. Myth 4: A good resume is all you need to get the job you want. A great resume that demonstrates your skills are a good fit for the employer's needs will typically get you to an interview, but that's as far as it will take you. The role of the resume is not to get you the job; it's to get you to the next stage of the hiring process, the interview. Your resume is a marketing tool; it is not your tell-all biography. You must be honest on your resume, but if there is information that does not support your application to a certain job, (for example, an unrelated job you held several years ago) it's fine, and often smart, to omit that information. Myth 6: You must include the phrase, "References available upon request" on your resume. And the opposite myth: You should never include the phrase, "References available upon request" on your resume. The phrase, "references available upon request" is completely optional. You can include it on your resume if you like, or omit it if you prefer. It is a standard phrase, and I can't imagine any reasonable employer faulting you for including the phrase on your resume. On the other hand, it's fine to omit the phrase. Employers know they can request a list of references, so you don't have to tell them that on your resume. Some "experts" get quite worked up about this phrase and imply that you'll never get a job if you include it on your resume. I find it hard to believe that an employer, eager to fill an open position, would read through a resume, see that a candidate looks like a great fit for the job, and then decide not to call that person in for an interview because they put "references available upon request" at the end of the resume. It makes absolutely no sense at all! The phrase is unnecessary. If you have a full resume with no extra space, you don't need to find room to add a line about references. However, if you've already sent out some resumes with "references available upon request" at the bottom, don't worry that it will hurt your chances of being called for an interview by any reasonable, intelligent employer. Myth 7: You must always include your hobbies on your resume; it shows you are a well-rounded person. Including a hobbies and interests section on your resume is rarely helpful. At the resume review stage of the hiring process, employers want to know that you have the basic qualifications to do the job and that there aren't any obvious red flags about weaknesses in your past job performance. Including your hobbies and interests on your resume takes up space and usually doesn't help to convince the employer that you'd be great at the job you are seeking. If your hobbies and interests truly say something positive about you as a potential employee, then including this information is fine. For most people, most of the time, including this section on a resume is not helpful. Myth 8: You must limit your resume to one page. There is absolutely nothing wrong with writing a two page resume if that's the amount of space you need to describe all of your relevant skills and experience. In fact, many people with well established careers would struggle to summarize all of their most relevant information on a single page. I have never seen a client struggle to find work because he or she had a two page resume. This piece of incorrect resume writing information is damaging because people either edit out important information to get a resume down to a single page, or they cram two pages worth of information on a single page to adhere to this so-called "rule". Bottom Line: Include all of your relevant information on your resume, do not go beyond two pages, and do not forgo readability just to cram ten years of professional experience, accomplishments and education on a single page. Myth 9: Unusual is good - it helps you stand out from the crowd. Unusual resumes may stand out from the crowd, but not in a positive way. They make you appear unusual, not professional. Job candidates who use brightly colored paper or fancy designs may get noticed, but rarely for the right reasons. An employer's first thought upon receiving a "creative" resume is not, "Wow, this is a creative person, I must bring him in for an interview." Instead, an employer more typically thinks, "Wow, this is weird and unconventional, and I don't want to manage someone who is unprofessional and can't follow conventions." Unusual resumes do not convey the professionalism and seriousness of purpose that is required in a job search document. There may be some exceptions to this rule in extremely creative fields, but for most people, most of the time, unusual resumes get you noticed for the wrong reasons, and your resume goes directly in the trash. 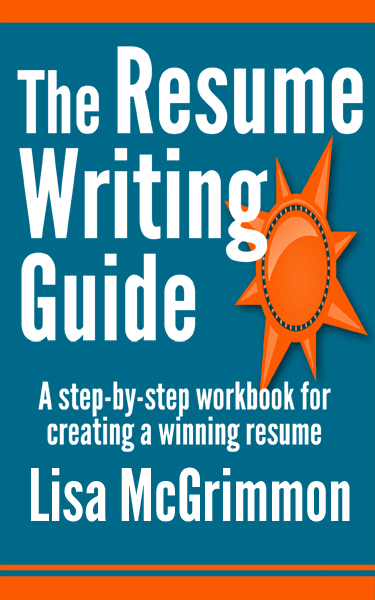 My book, The Resume Writing Guide, shows you how to write a resume that stands out from the crowd in a truly positive and professional way. It is the culmination of years of working with hundreds of clients and writing over 1000 resumes, and it will show you exactly how to write a resume that shows you at your very best.